I don’t mean in life, for that you’ll need more than just our help! I mean in Salsa. What is the correct timing for L.A Style Salsa or Salsa-on-1? How do you find the first beat? Do the rest of the beats matter? The first beat is important. It is where it all starts, and it is where you need to start! There are tricks to finding the first beat, sometimes it is an emphasised beat, sometimes it is the beat that the singer or the background singers start on. Mostly, you’ll just have to practice and keep practicing until you get it, eventually! If you want to look at the technicalities of finding the first beat have a read of what the Dancing Irishman has to say in How to find that goddam 1 beat in salsa. If all your steps are quick and there is no slow, it means you are not giving time to the 4 and 8 and therefore you will find yourself out of time with the music. 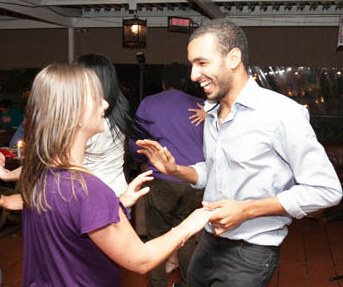 If all your steps are slow in your salsa basic, it generally means that you are completely out of time with the music! There are of course those steps that you will learn at a more advanced level where this basic rhythm changes, but the more you practice this the better you will become! 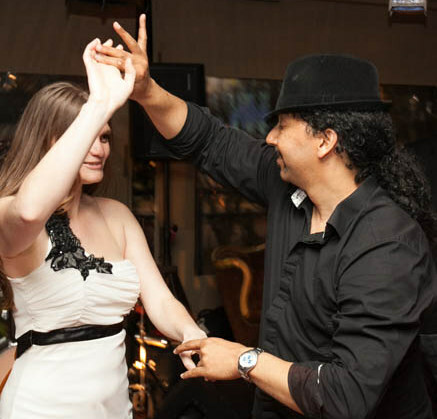 And here is another tip, the faster the song you are dancing to, the more important this rhythm is! So listen, listen, listen! The music is not there to create a nice party vibe while you dance; it creates your dance- keep listening! What takes a dance from being a series of spins and steps to being that 3-minute-moment you want to repeat over and over again? Is it the song? Is it your partner? Is it your own dancing? I say, all of the above and more! There are several aspects for me which takes a dance from just a dance to that dance, the very reason you came out that evening. The first aspect is the music- when the music strikes its first note within your being and you start moving to it before you hit the dance floor, you know its going to be a very good three+ minutes, but there are several more aspects which come into play. One is your partner during that song. Is your partner enjoying the music? Do they connect with you by looking you in the eye and smiling? Is there laughter between you when a mistake is made by either of you? Or is he or she too worried about the next step? Or too worried about the people watching so that they are forgetting to enjoy the moment with you? Or too worried about his leading or her following? These things make a huge difference in a dance. Are you overly worried while you’re on the dance floor? Your partner can tell and it is minimising their enjoyment of the dance. 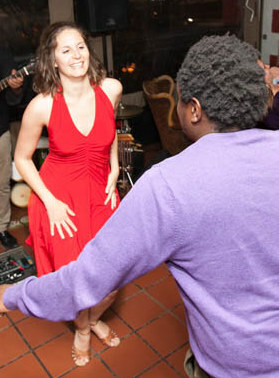 The next time you dance with anyone, look them in the eye, allow that connection between you, smile and laugh and enjoy yourself! But there is another aspect in making the dance that dance. That dance is a dance which includes what I like to call play. Play I will define as spontaneous movement originating from either of the partners, to which the other partner responds spontaneously without either partner taking away from the current step or beat. Therefore play at a simple level could be seen as styling, but it is also so much more than styling. It is dancing! It is styling that involves spontaneity within a four-way connection. It is your connection to the music, your partner’s connection to the music, your connection to your partner and your connection to yourself. To play in a dance you need to be able to dance with more than your feet and the steps and patterns which you have been taught. You need to dance with your entire body! Play can involve popping or rolling, flicking, combing, twisting and even hopping and so much more! Do you play when you dance? If you’re keen to learn a little more about how to play within a dance, pull in at our BODY MOVEMENT WORKSHOP on SATURDAY 24th November at 3pm at Barbosa Social Café! Contact us to book your place!